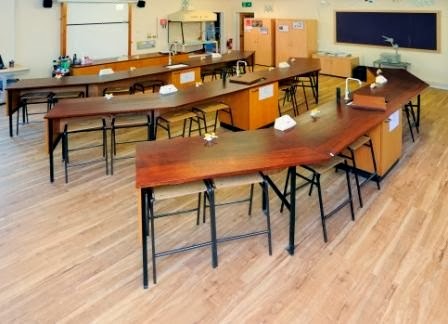 Expona Control, Polyflor’s groundbreaking new flooring concept has been specified and installed in laboratory areas at the prestigious Rye St Antony School in Oxford. ‘Expona Control was the only product which met our requirements in terms of the look and performance of the floor which was essential in our busy laboratories where there is an obvious risk of spillage’. 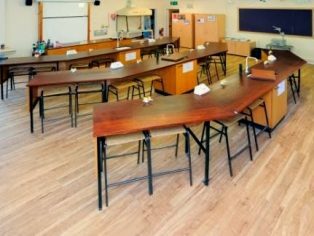 Over 300m2 of Nut Tree from the Expona Control collection was installed by Reading based Paul’s Floors throughout the laboratories and adjoining circulation areas. Expona Control is the world’s first LVT which offers sustainable slip resistance when wet in accordance with HSE guidelines and is the culmination of Polyflor’s expertise and creativity in the manufacturing of LVT and safety flooring. The design focussed 14 colour collection features authentic wood and stone designs and achieves the required slip resistance through the inclusion of aggregate throughout the wear layer. Unlike traditional safety floors Expona Control is complimented with a range of inlay strips allowing for countless design possibilities. Tiles and planks from the wood and stone collections can also be installed side by side to delineate rooms and create zonal areas. The possible combinations and design options present Expona Control as a more creative concept allowing truly bespoke floors to be realised, whist also offering the reassurance of sustainable slip resistance. Expona Control offers the same level of slip resistance as Polyflor’s market leading Polysafe ranges. Achieving 36+ in the pendulum wet test and 20 microns of surface roughness the slip resistance is sustainable for the life of the product. The enhanced wear layer creates a rougher, harder friction surface to ‘bite’ into the sole of footwear, to create the necessary durability and underfoot safety. In fact once Expona Control is installed and maintained correctly the slip resistance will tend to improve with time. A clean floor is a safer floor and the incorporation of Polyflor’s PUR technology provides an easier regime for maintenance staff and a reduced need for energy, power, water and chemical consumption.